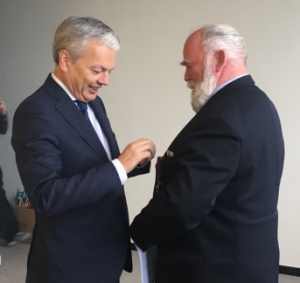 The King of Belgium has granted the Belgian Officier de la Couronne (Order of the Crown) to FIG Honorary Member Jan de Graeve. 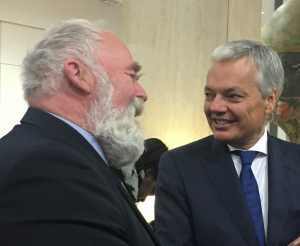 The Order was presented by The Belgian Foreign Minister Didier Reynders on 12 December 2016. Jan de Graeve receives the Belgian Order by Didier Reynders, Foreign Minister of Belgium. 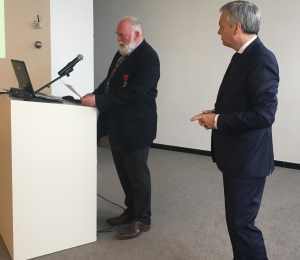 Jan de Graeve has been President of the Association of Surveyors in Belgium and has also been an eminent member of the executive committee of the Brussels Map Circle, which brings together specialists in maps, atlases, urban views, whether scientists, experts, amateurs or collectors. He has made a reconstruction of the library of Gérard Mercator, including many works of the 16th century with an unrivaled museum quality. For many years Jan de Graeve has been a well know face in FIG. He has been enjoying more than 35 years active participation to FIG events since his first meeting in Paris 1978, where he brought an exhibition of the start of FIG in 1878 and some of the original photos of the first meetings and also all the reports and publications of all the FIG congresses. He has only missed very fey yearly conferences and meetings since then, and we hope to see him at many future Working Weeks and Congresses. He was one of the founders of the FIG International Institute for History of Surveying and Measurement. For some years it operated within one the nine commissions of FIG but as from the Congress held in Brighton in 1998 it was deemed a Permanent Institution. Today Jan de Graeve is still director of IIHS&M. Over the 30th arc. Jan was rewarded to become a honorary member of FIG! The distinction was followed by a presentation on the theme "Scientific measuring instruments in the 16th century". FIG Congratulates Jan de Graeve.